2K has announced that Firaxis Games is working on Civilization V, the PC-only sequel to 2005's Civilization IV, set for release this fall. If you were a little disappointed in 2008 when Firaxis revealed that Civilization Revolution, the last title in Sid Meier's long-running strategy series, would be console-only, then you'll be happy to learn that the developer is returning to its PC roots for the next Civilization game. 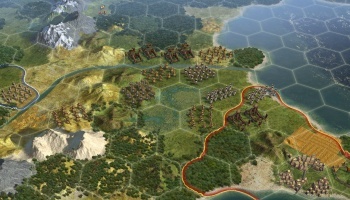 In addition to featuring improved graphics over its predecessor, 2K says Civ V will add new elements to the series, including a more intuitive interface (with "trusted advisors" who will assist you with unfamiliar aspects of the game), the addition of City States as a "new diplomatic battleground," improved combat, including the ability to bombard enemy units from a distance, and an in-game community hub that will make sharing custom levels and chatting with other Civ V players even easier. Details are still scarce at this point - 2K hasn't even set up an official site for the game yet - but my knee-jerk assessment is that they've taken some of the more intuitive aspects of Revolution and brought them back to the platform where the game belongs. And if it plays as well as Civ IV does, then I imagine I'll be losing at least a month's worth of weekends come autumn.